As a counterpart to the scones, I put together a cheddar beer biscuit recipe for David. Little did I realize that by doing so, I had sent David down the path to learn the art of the biscuit. The cheddar-corns were only the beginning. As of now, we’ve made several versions of the biscuits, with beer and without, with cheese and without, with buttermilk and butter; lastly, with olive oil and yogurt. We’ve both gained a little weight as a result of our tasty, tasty biscuit experimentations. Bake for about 15 minutes at 450. For our first attempt. We chose Spaten lager as our beer—light, a little bready, but not too overpowering. David mixed up the dough and then asked me if we had a cookie cutter to cut the biscuits. We only have one cookie cutter. I got it from one of my parents for Christmas. It’s exactly like the one we used to make cookies with when I was a kid. The idea of making unicorn shaped beer biscuits was very appealing (at least, to me), so we went for it. The next version involved whole wheat flour and Old Rasputin stout. These biscuits were dense and darker than the last batch. They stuck with you, while the whole wheat flour lent a little bit of bitterness to the batch. 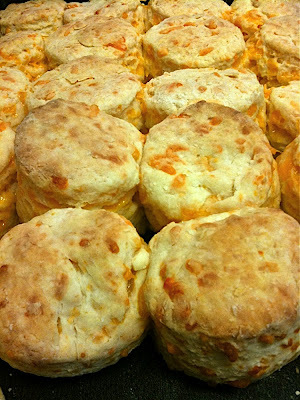 Then there were the cheddar chive drop beer biscuits made with white lily flour and Victory Golden Monkey. And the buttermilk cheddar biscuits. These don't have any beer in them, but look so nice I couldn't leave them out of the post. *Not all readers will get this reference.